When confronted by a film marketed as a “master class on movie editing”, it might seem easy to assume its appeal would be limited to only those interested in filmmaking process. Somehow, however, Edie Ichioka has captured an interview with Walter Murch that certainly lives up to its press, but should also appeal to anyone interested in film or film history. A brief look through IMDb will demonstrate Murch’s credentials: nine Oscar nominations for three wins; editor or sound design for films such as Apocalypse Now, The Godfather trilogy, Touch of Evil (1998 restoration), American Graffiti, The English Patient, Cold Mountain and Jarhead. What IMDb won’t reveal is that this is the man who invented 5.1 surround sound for Apocalypse Now, changing forever how film soundtracks are recorded and presented, and essentially created the job of Sound Design for movie production. He was also heavily involved with American Zoetrope, the studio created by Francis Ford Coppola and George Lucas that is responsible for much of their early work. 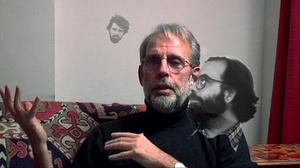 The vast majority of Murch: Walter Murch on Editing is just a simple head and shoulders shot of Walter Murch talking to camera, and it is amazing that this doesn’t become dull. The success of the film lies mostly with the charisma of the subject, with Murch telling story after story of his involvement in key moments in film history, and relating editing and sound design decisions to everyday scenarios that can be understood by a lay viewer. There may not be many subjects who could talk for 76 minutes and hold the attention of an audience, but in his clear and insightful explanation of technique he captures the audience and keeps their attention. The filmmakers are helped in this goal by the fact Murch is discussing several high profile films and describing key sequences that many people will recall. That they can cut to a particular scene in The Godfather or Touch of Evil and provide the visual respresentation of what Murch is explaining is a great advantage. Familiarity with these films should mean the audience are interested in the how and why that Murch provides. Edie and David Ichioka have then edited the interview to demonstrate the editing and sound design principles Murch may be discussing at that moment on screen: when discussing the placement of speakers for surround sound, for example, the sound levels for each speaker are raised and lowered to alert the audience to the individual presence of each. The Ichiokas appear to have had great fun playing with their footage to illustrate Murch’s points, and the audience has fun with them. In addition to providing an insight into a period of film history and several key figures within it, Murch: Walter Murch on Editing makes far clearer the roles of the editor and sound designer in the filmmaking process, and does so in a light-hearted and always entertaining fashion. Likely to be enjoyed by anyone with an interest in film, this is an easy film to recommend.